Discussion in 'Australia, NZ, Pacific' started by DennisTate, Apr 18, 2018. Where should Sorek 2 be located? Other... please specify in a reply. Or perhaps in Mexico to produce fresh water for an Alternative Wall? I live in Nova Scotia, Canada and I am worried that the residents of the town of Truro, N. S. may be in the position of being the most vulnerable to rising ocean levels so...... I feel a responsibility to get people talking about the option of ......... deliberately LOWERING ocean levels by fifteen centimeters (6 inches).... to create a buffer zone just in case rapid cracking and sliding of ice off the West Antarctic Ice Sheet or Greenland were to begin. ... that you and the people of Cumberland - Colchester are in a perfect position to assist him with. 627,000 x 2000 = 1,254,000,000 cubic meters of ocean water daily! are vulnerable to rising ocean levels. Can you think of any better way to divert one trillion of those 4.3 trillion USA Petro-dollars that could potentially be used to attack the USA economy? organizing a serious devaluation of the USA petro -dollar. According to a new SEC filing, Buffett is sitting on $55 billion in cash through his company Berkshire Hathaway. This is highly unusual behavior from a man often called "the world’s greatest investor." It’s the biggest cash hoard the company has ever amassed, in the 40 years he’s been in charge. But he’s not the only famous investor who fears a dangerous correction is coming. New filings also revealed billionaire George Soros’ massive short position on the S&P 500. Previously, Soros allocated 3% of his portfolio to shorting the S&P. It’s a common practice major investors use to insure their positions against unforeseen pullbacks. That is an alarming sign that Soros is betting on a market collapse. And given his track record of predicting these events, it’s one we should not ignore. So the question remains: Why are some of the “greatest investors alive” betting against Wall Street? According to Jim Rickards, the CIA’s Financial Threat and Asymmetric Warfare Advisor, they are taking emergency measures now before a historic economic meltdown strikes – one he, and many of his colleagues at the U.S. Intelligence Community, fear is unavoidable. It was an exceptionally well informed member of Politicalforum who made me aware of just how many USA petro - dollars are out there in the hands of nations, companies and individuals who are not exactly friendly to the USA. A very simple and easy to understand explanation of why climate change is REAL. Members here can argue against GW all they want but there is ONE INDISPUTABLE FACT!! That being that due to overall higher global temps. Polar and Greenland Glacier Ice Melt is causing the worlds oceans or sea levels to RISE AT AN UNPRECEDENTED RATE!! Coastal U.S. Cities such as Boston, NY, Miami...etc.....are spending BILLIONS UPON BILLIONS OF DOLLARS to combat rising ocean sea levels by building everything from coastal breakwaters and damns and dikes to building Multi-Billion Dollar Ocean Water Pumping Stations like in NY and Miami as sea levels are so high RIGHT NOW that even a small or moderate storm water surges are COMPLETELY FLOODING the streets of such cities and flooding the street drainage and sewer systems thus these massive pumping stations are necessary. So members can argue all they want but what is HAPPENING NOW cannot be denied!! If..... Australia and California could cooperate to save Americans in Miami, New Orleans, New York and New Jersey....... billions and billions of dollars....... would your project grab the attention of anybody in America? You do know that at least one Canadian would be interested, me! A carbon tax will cost Canadians ten billion dollars annually. The increase in the interest payments on our national debt is even more alarming. We Canadians have a much better option than what has been happening since 1974. “As the deep recession dragged into 1992, Finance Minister Don Mazankowski said he couldn't do anything about it. His hands were tied, he said. The federal government was broke. The cupboard was bare. The deficit and accumulated national debt were so enormous that his first priority had to be to reduce them — even if that meant prolonging the recession and making it even worse. “So his budget contained almost nothing to revive the sick economy. With interest payments on the debt gobbling up one-third of tax revenue, his response was to keep taxes high and axe more public services and agencies. Like Martin Luther before him, Mazankowski in effect proclaimed: «Here stand I. I cannot do otherwise. “But it doesn't take an economist to see that in fact he could. All you have to do is imagine what the government would do if it got involved in another Gulf War — or if that war were still raging. Would the Finance Minister have brought down the same kind of budget? Would he have said, «We'd like to keep on fighting, but we're broke, so we're calling our troops back»? Not on your life! “Did Canada surrender half way through World War II because the national debt had grown even larger than the Gross Domestic Product (GDP)? Of course not! Somehow the extra money was found. If it wasn't by raising taxes or borrowing from the private banks, why, the Bank of Canada simply created all the money the government needed — and at near-zero interest rates, too! “Why isn't the same thing happening today? 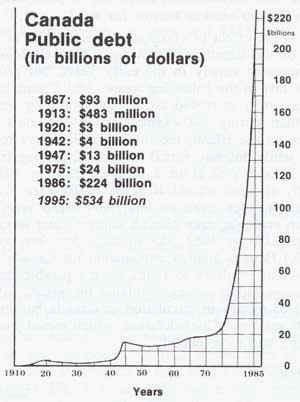 Why was a much larger national debt shrugged off in 1945, while today's much smaller debt (as a percentage of GDP) is being used as an excuse to let the economy stagnate? “The answer can be found at the Bank of Canada. During the war, and for 30 years afterward, the government could borrow what it needed at low rates of interest, because the government's own bank produced up to half of all the new money. That forced the private banks to keep their interest rates low, too. P.M. Pierre E. Trudeau made a serious error in 1974. But..... he was probably pressured into doing this by huge American banks. We need to discuss ways to finance saving the environment that will actually work.... such as many replicas of Sorek in nations experiencing shortages of water. I am hoping that they messed with the wrong man! Did going bankrupt in '91 prepare Mr. Trump for the Presidency? Later in 1988, Trump acquired the Taj Mahal Casino in Atlantic City, New Jersey, in a transaction with Merv Griffin and Resorts International. The casino was opened in April 1990, and was built at a total cost of $1.1 billion, which at the time made it the most expensive casino ever built. Financed with $675 million in junk bonds at a 14% interest rate, the project entered Chapter 11 bankruptcy the following year. Banks and bondholders, facing potential losses of hundreds of millions of dollars, opted to restructure the debt. I saw over half of Mr. Al Gore's new movie yesterday evening.... I will finish watching it as soon as i have more free time and I do highly recommend it. I saw it on Netflix documentaries. Considering his footage from Florida..... it looks like we can go ahead and initiate the deliberate lowering of ocean levels immediately. A decade after AN INCONVENIENT TRUTH brought climate change into the heart of popular culture, comes the riveting and rousing follow-up that shows just how close we are to a real energy revolution. Vice President Al Gore continues his tireless fight traveling around the world training an army of climate champions and influencing international climate policy. Cameras follow him behind the scenes – in moments both private and public, funny and poignant – as he pursues the inspirational idea that while the stakes have never been higher, the perils of climate change can be overcome with human ingenuity and passion. I have to admit that as he was complaining about how his message got ignored....... I remembered how he and his team had ignored the recommendations from Mr. Carl Cantrell and myself from back in 2007. My two somewhat humorous submissions for $25 million Virgin Earth Challenge. Back in 2007 Sir Richard Branson and Mr. Al Gore announced the Virgin Earth Challenge! I had watched "An Inconvenient Truth" several times already and I was thinking about another angle on the subject that would fit better with Isaiah chapter 35.
history has shown that prizes of this nature encourage technological advancements for the good of mankind. the stability of the Earths climate." Anti-Armageddon Paradigm Shift Monetary Policy Theory The Introduction. "Dr James Hansen, Director of NASA's Goddard Institute for Space Studies: "I think we have a very brief window of opportunity to deal with climate change ... no longer than a decade, at the most. This is why I am supporting the Virgin Earth Challenge as a judge, we must explore all means, both known and unknown, to help alleviate this crisis." It is my firm belief that the number one technological device to reduce atmospheric greenhouse gases has already been invented. It is the tree. What is desperately needed at this time is not necessarily a new mechanical device but instead a paradigm shift in economic theory regarding monetary policy. We require a readily understandable explanation on how leaders in business and government can direct not only millions, but actually trillions of dollars of investment into combating global warming. So who is going to finance the construction of all these massive installations not to mention the planting of all those seedling trees? I believe that it is possible for you to do this yourself Mr. Branson. You have already created a Virgin currency unit/coupon which has astonishing long term potential. My wife Maria Jose just returned from a two week trip to the British VIRGIN Islands. It is theoretically possible to link your Virgin coupon with the national currency of a small nation and you could soon be playing around in macro-economics. Considering the volume of business being done through your Virgin Group I would submit that you already are. Pope Benedict XVI may be in an even stronger position than you Mr. Branson to transform the world economy virtually overnight through the introduction of a new Vatican Currency Unit that could be linked with each and every national currency where the Vatican State is free to do business. I plan to elaborate in great detail on these two major alternatives in a later writing but I felt that you and your staff should now see the simple explanation that I wrote up for applying this theory within a micro-economy to greatly reduce unemployment. Although combating global warming would seem to be a conflicting goal to job creation, there need be no dissonance when we all have a better grasp of the big picture. I ran as an independent for the office of MLA in the most recent Nova Scotia provincial election. From 1940 to 1970 the Government of Canada put roughly half of the total money supply into the economy through loans issued through the federally owned Bank of Canada. Provincial and municipal governments could borrow the money to build roads, schools, hospitals and sewage treatment facilities at zero or one percent interest. In 1970 we changed our system and since that time a higher and higher percentage of all government debt is financed through loans issued through privately owned banks. At this time it is ninety eight percent. This policy may be great for our banking sector but it was estimated that in the one year of 1995 alone our federal government could have saved roughly SIXTY FIVE BILLION DOLLARS in interest payments if we had gone back to creating half the total money supply through these low interest rate loans issued through the bank that is OWNED BY ALL CANADIANS. 2. Town and municipal government officials in New Glasgow, Stellarton and Trenton should seriously consider creating a local currency unit such as has been done in Ithaca, New York. p.s. I shall be back to you shortly Sir with an explanation of how your Virgin Group could implement this theory in a form that for all intents and purposes could be patented/copyrighted. "And the LORD said, Behold, the people [is] one, and they have all one language; and this they begin to do: and now nothing will be restrained from them, which they have imagined to do." (Genesis 11:6 KJV). "A feast is made for laughter, and wine maketh merry: but money answereth all [things]." (Ecclesiastes 10: 19). I am extremely glad that you are all doing your best to attempt to find a method to save the earth from the many perils associated with global warming. I believe you will be tremendously encouraged by the theory presented by biologist Carl Cantrell who makes a convincing case that global cooling can be initiated simply by pumping vast quantities of fresh water into the worlds largest deserts. In Anti-Armageddon Paradigm Shift Monetary Policy Theory  The Introduction I stated that you Sir Richard, or perhaps the Roman Catholic Pontiff were two of the most logical choices to FINANCE this possible remedy for global warming. I shall attempt in a later writing to elaborate on a method whereby perhaps I may be able to finance this project myself through an organized barter and film production company that works in cooperation with several other film production cooperatives and/or companies. Here is a brief outline of how this could be done. I work night shifts stocking the shelves at the ........ grocery store in Antigonish. Next I plan to encourage various local church and other non-profit organizations to become involved in a reality and/or semi reality film series where organized barter is used as a tool to raise funds for worthy projects that they desire to accomplish. quasi-religious transformation of contemporary cultures." (Coming of The Cosmic Christ by Dr. Matthew Fox). I completely agree with these comments quoted by Dr. Fox. It will be necessary to generate interest among and enlist the assistance of many of the deeply religious salt of the earth type of people in each nation if we are to succeed in preventing the destruction of Mother Earth. I plan to get back to you soon with results from various groups as I submit this proposal to them. I also plan to make you an offer to purchase a significant share of a barter and film production company that I have had on my mind for several years now. Thank you for considering our submission. I don't know how much money in Australia you think is available for that sort of investment Dennis, but I don't think it's that much. Ps . Grand scale reafforestation is a very good idea. George Soros succeeding in his plan to devalue the USA dollar. time to take the man seriously! high tide levels is true.... then residents along the Bay of Fundy in Nova Scotia, New Brunswick, Canada and the USA State of Maine will be hit first....... Anchorage, Alaska will probably be hit second hardest because they have the highest tides after The Bay of Fundy. But.... we Canadians are not in a position to desalinate huge amounts of ocean water so....... what we need to do is inform other nations of this option. lower ocean levels at the same time that we produce lots of extra fresh water, food and new forests..... then the USA is in a position to loan us those 4.3 trillion AT ZERO INTEREST just to ensure that they don't end up hitting the USA markets too fast...... in a disorganized manner and causing even worse chaos than Soros managed to do in other nations. We Canadians and you Australians don't really want our dollars tied to the USA dollar..... but...... the risk of a devalued US dollar that is replaced by a Chinese currency is so great.... that it seems to me that we should be discussing how we can assist America with this serious threat! No....the Saudi's are using a Plan and Plant provided to them in a proposal a DECADE AGO!! 2014-2015 Tech......pump sea water into the desert into shallow pools. Step 2.....completely encase them in an air tight double membrane 1st membrane water vapor permeable....send membrane...not. Step 3.....Sun creates H20 Evaporation.....only pure water is collected between the membranes. Here is another project that is all solar energy. By establishing a saltwater value chain, the Sahara Forest Project will make electricity generation from concentrated solar power (CSP) more efficient, operate energy- and water-efficient saltwater-cooled greenhouses for growing high value crops in the desert, produce freshwater for irrigation or drinking, safely manage brine and harvest useful compounds from the resulting salt, grow biomass for energy purposes without competing with food cultivation, and revegetate desert lands. The synergies arising from integrating the technologies improve performance and economics compared to those of the individual components. In addition to its commodity outputs of food, energy and salt, the system also provides global climate benefits by sequestering CO2 in the facility’s plants and soils, and by pushing back the accelerating process of desertification through the revegetation of desert areas. – Saltwater-cooled greenhouses – greenhouses that uses saltwater to provide suitable growing conditions that enable year-round cultivation of high-value vegetable crops even in desert conditions. By using seawater to provide evaporative cooling and humidification, the crops’ water requirements are minimized and yields maximized with a minimal carbon footprint. – CSP for electricity and heat generation – using mirrors to concentrate the sun’s energy to produce heat that is used to make steam to drive a steam turbine, which in turn drives a generator to produce electricity. – Technologies for desert revegetation – a collection of practices and technologies for establishing outside vegetation in arid environments, such as evaporative hedges. By establishing a commercially viable way to bring saltwater into the desert, the Sahara Forest Project works as an enabling technology, creating opportunities for a wide range of businesses to develop alongside it. These include salt extraction, traditional desalination, algae production, halophyte cultivation, PV, mariculture, bioenergy and more. The studies prepare for the construction of a 20-ha (200.000 sqm) SFP Demonstration Center, which will serve as a center for innovation, competence building, and demonstration of the economic viability of the SFP concept. The Center will be located near Aqaba, Jordan. The Aqaba Special Economic Zone Authority will facilitate the necessary land area for The Sahara Forest Project Center, including a corridor for the salt water pipe running from the Red Sea to the Center. The Aqaba Special Economic Zone Authority will also assist SFP AS in identifying and securing 200 ha (2.000.000 sqm) for later expansion. The studies in Jordan have been carried out by The Sahara Forest Project in close cooperation with a large number of partners and contributors with diverse backgrounds and expertise. The Sahara Forest Project puts a high priority on its relationships with the scientific and business communities in Jordan and promotes a high degree of knowledge sharing between the various contributors. In-depth knowledge of local conditions, whether they are ecological, social, or commercial, is key to the success of the project. In every one of its undertakings, The Sahara Forest Project designs the SFP concept to best serve the environmental, social, and economic needs of the local communities. From what I have read the Israelis donated the technology to Norway...... because they knew that the Islamic nations would not accept the assistance directly from them. put forward as a form of "art." possible way to achieve anything resembling full employment? Jubilee 2018, Unified Field Theory of M.W.P's, opening gambit Australia. What of salt pollution as hyper salty water is returned to the sea. like car exhaust and smog. What are your plans for that Dennis Tate? Or just put it off to future generations. Is It True, Part Deux. Sallyally and DennisTate like this. than that we get it from other sources. those trace minerals can have on humans has great potential to increase longevity and health...... and reduce our dependence on Big Pharma. Trace minerals and longevity + health? Today's food lacks trace minerals in food. We live with a trace minerals deficiency problem. We are trapped in an accidentally manmade Trace Minerals Famine, which today causes immune weakness and the contemporary Aids problem. Our food chain lacks in vital trace minerals that affects plants, animals and humans. Sick soil, sick plants, sick humans. The trees are nature's only trace minerals rotating tool. Without adequate tree cover nature's trace mineral treasure is washed down and out of reach for short rooted vegetation, the vegetation that provides our food. With the removal of the tree, nature's trace mineral rotator, we have placed ourselves in a trace minerals famine. Consequently, we are suffering. Peter Staheli's All Mineral Theory blames trace mineral deficiency in our modern food for unnatural spread of Aids. New research shows that the people who have another source of all trace minerals reaching their bloodstream to feed a vigorous natural immunity helps to fend off Aids. They have alternative source of drinking water, from artesian bores, deep wells or ground water resources. Any underground water naturally carries virtually all the 92 minerals that Earth is made up of. Whether the water is from the famous springs in Switzerland, the Australian Artesian Basin, an African country well, or any other place on the Globe. They are all equal in respect of all trace mineral quality and suitability for human consumption for the benefit of natural immunity. The miraculous healing power of underground water is old and proven wisdom. Therefore, spring water is sold all around the world today because of its health benefits. Therefore, to remove hunger from Sub Saharan Africa and tackle the AIDS pandemic, drill a deep well and harvest the drinking water for the whole community. Peter Staheli also offers an agricultural methodology to overcome this current Trace Minerals Famine. It is an easy way to lift us out of this trace minerals famine and return us to natural immunity and natural health. This all trace minerals fertilizer carries the exact proportions of trace minerals like sea water, which is the cradle of human life. One application on agricultural land and grazing land will last for 10 years. The cost to apply this all trace minerals fertilizer would be half of an application of, for example, Super Phosphate and without any dangerous effect. Through this new science we are able to restore our planting and grazing lands to full natural all trace minerals quality as it was before we ruined our planting and grazing land. This all trace mineral means can be taken in at costs of about One Australian Dollar per person per yearand is easily available in any quantity of never ending supply. Through this new science. Aids and Cancer and many other neo-civilization ills could be naturally prevented and we could once again enjoy vibrant health. Our modern food has become lethally deficient in trace minerals leading to unintentional Trace Minerals Famine. This kind of famine is totally manmade. Nature has not changed, but we have changed the nature of our existence. And through this change we call on degeneration and all its natural consequences where Aids plays an ever increasing role. Past famine experience and old farming wisdom tells us the real story. Such history reveals that famines and widespread malnutrition has always been the source of immune weakness, odd ills and epidemics. Aids played a major role in all the historic famines. Aids played a role in all the ancient cultures where wrong nutrition and drugs interfered with the natural immunity of the population. Aids is not a new illness, but due to its insignificance has never been recognized until our modern society has fallen itself into nature's Aids Trap through mass food production of inferior quality and abusive lifestyle. Apart from our contemporary all trace minerals deficiency our food today is also becoming increasingly less suitable for human digestion that is of herbivorous characteristic. Our ill selected modern food and junk-food causes a build up of unaccustomed uric acid in the human body. Our modern food market generally offers foods that are predominant in acid (non-metallic) minerals. An intake of such predominant acid quality is not suitable for the human (prevailing-herbivorous) digestion. Consequently, our modern predominantly acid foods are fostering illness through unnatural build up of uric acid in the human body. The giant tree is nature's Trace Mineral Rotator. Through its deep reaching roots the tree enriches itself with all the trace minerals. Through its leaves this all trace mineral treasure is spread again and again all over the surface of Earth for the benefit of short rooted vegetation. The all trace minerals quality (pink color) is evenly distributed and accessible to all vegetation. The food chain is still in natural order. Our contemporary agricultural land is treeless. The Trace Mineral Rotation is dead and consequently man and livestock are trapped in a Trace Minerals Famine. The food chain has become defective in trace minerals. The trace minerals are still naturally washed down by rainwater. Consequently the top soil becomes more and more deficient in trace minerals. The trace minerals (pink color) are not evenly distributed anymore, but washed down into the deep layers of the soil and, therefore, out of reach for short rooted vegetation. The roots of vegetables, wheat and other human plant foods cannot reach down to the deeper soil layers to enrich themselves with all the vital trace minerals. Also our modern human food chain has become defective in trace minerals. Consequently this deficiency in trace minerals starves the human immune system of vital minerals for its anti bodies biochemistry. Aids and Cancer are classic immune deficiency syndromes and even our younger generation suffers from these syndromes because they cannot escape this lethal Trace Mineral Famine. The natural nutrition is composed of 92 chemical elements. Humans are omnivorous creatures. As a result there is uric acid accumulation in the human body which is the root cause of serious diseases. Life is a self-propelled biochemical process that originated in the sea. For such an immensely complex biochemical life process needs all the minerals to be able to perform naturally. Human intelligence mired in information age mumbo-jumbo will never be able to comprehend it completely. What for example do we know about our brain functions, how do we think and memorize? Our science knows very little about this. Therefore, we need to approach our modern health dilemma with logic evolutionary facts and not with medical guesswork. Good health and a long life is achievable only with the true natural food. Remember what the Romans did to Carthage agricultural fields. How much "salt" you gonna dispose of on yours? Trace Minerals is just "salt" like NaCl. An abundance ain't a good thing. like automobile exhaust circa 1900. Is that the message of the Salt The Earth movement? I have to admit...... that I don't like the idea of using salt even on icy roads... but that is what we Canadians in Nova Scotia use at this time........ so at least it seems like a good way to make use of a by product of attempting to keep ocean levels stable..... at the same time that we produce more food..... and increase the number of CO2 eating plants. I was hoping that the trace minerals.... could be separated from the NaCl in an economical manner........ so if the trace minerals are added to fertilizer..... (as Dr. Rebello's article suggests can be done very economically)......... then it would be merely trace minerals added to the fertilizer.... not the NaCl. My wife and I have been using Himalayan pink salt for the last couple of years due to the abundance of trace minerals that it is supposed to have. I assume that the dollar stores would be more than willing to stock low cost by product sea salt that is even cheaper than what they have now if we decide to go all out in desalination of sea water on a large scale. What are you going to do with all that salt? Bury it like nuclear waste? Frankly..... I think that you are correct.... that would be the ideal way to avoid having to use salt on our roads........ and have some excess electricity for the grid as well! so... maybe we could feed a lot of it to all the cattle and beefalo needed to save the world?! I love the nice progression of logic in this presentation. Running the numbers like this shows not only how powerful a carbon sink our earth’s soils can be, under the right management, but also just how futile and what a goose-chasing diversion most contemporary technological ‘fixes’ for climate change really are. When you see the upwardly stepped red line (10:32) showing the seasonal rise and fall of CO2 concentrations (zigzagging seasonally due to the massive intake of CO2 by the northern hemisphere’s deciduous forests over the north’s summer months), try to imagine how that line could peak and begin to step downwardly. It can happen — with holistic education aimed at a widespread effort towards large-scale rehabilitation of our soils; be they deserts, savannahs, scrub lands, set-asides, farms and gardens. Rapid revegetation can put our CO2 rich skies back into balance — pulling the carbon down into our soils, where it becomes a source of fertility, and thus even more vegetation…. The cycle of stupidity, that is our current carbon cycle, can thus become a cycle of stability, health and prosperity. And, in case you think it can’t be done, consider that we’ve actually cooled the earth before — and not that long ago. Take a look at what is now termed the ‘little ice age’, which ran approximately from 1350 to 1850AD. Over these centuries there were a few significant dips in average global temperatures, and there is a lot of evidence to show that these cooling periods were caused by rapid regional revegetation in Europe, Eurasia and the Americas. In this case the rapid revegetation was caused, not by the work of such educational institutes as our own, but rather because of a sudden die-off of human population numbers, due to disease. commentary on where I believe this could potentially lead. I'm reading Warren Mosler's 'Seven Deadly Frauds of Economic Policy'. About 10 years ago I read Michael Rowbotham's 'The Grip of Death' and Ellen Brown's 'The Web of Debt'. One of my big takeaways from Rowbotham's book was the idea of 'free money' - money that circulated in the economy without a corresponding debt obligation. I think all of these authors are kind of on the same page in realizing that federal deficits allow more 'free money' into the economy. One of the things I haven't picked up on yet in Mosler's book (or in the other two books) is the idea that bankruptcies and foreclosures are also ways for 'free money' to be added to the economy. Does anyone know of authors/bloggers who have thought about this? The way I see it, people make contracts all the time that impose legal obligations for payment (for services or goods or whatever), without a corresponding (necessarily) increase in the money supply. Delinquencies, bankruptcies, foreclosures, etc... are positives from a 'free money' perspective. They reduce the need for the fed deficits. Or maybe I should say that delinquencies, bankruptcies, etc... from banks and other financial institutions allow more free money into the economy. Does this 'free money' eventually become part of the fed deficit? How does the accounting on that work? Does someone have a resource that goes through that sort of like Mosler goes through other aspects (in less technical terms)? Not saying this is good or bad. My whole thing is looking at how we can combat climate change. On the one hand, I like MMT for pointing out the need for fed deficits to reduce bankruptcies, etc..., but to me the greater question is how do we change the equation so people value the planet enough before it's too late? Yesterday, I asked a banker about banks creating money. I had an absolutely captive audience because I happen to be refinancing my mortgage, and he asked if I had any questions... "Wait, I can ask anything?" "Sure, I'm here to help you." "Where does the money come from that is going to fund my loan? It doesn't come from depositors because account balances are always available..."
Pause for a moment, then he smiled. "It comes leveraging from the bank's assets. We can make a deposit into your account because the bank itself is creditworthy." "So, it doesn't come from anywhere. You just input the numbers and you're allowed to do so because the bank has enough reserves or sellable assets to make settlements with other banks. How long have you realized that banks create money?" "When I started in the mortgage department ten years ago, I didn't want to believe it, but after a few years behind the curtain, I understood. We convert promissory notes into dollars and broker them or hold them." But for God sake let's not do something new or innovative, let's just stick to what we know ,digging up stuff and burning stuff, and if we don't understand it, kill it. It got us out of the caves. prevent the USA dollar from going into a serious devaluation trend. Those are doomsayers Dennis. But usually things turn out to be okay. we are in for a major shift. but..... we need to be thinking in terms of the big picture. The Spirit of God says, I have chosen this man, Donald Trump, for such a time as this. For as Benjamin Netanyahu is to Israel, so shall this man be to the United States of America! For I will use this man to bring honor, respect and restoration to America. America will be respected once again as the most powerful and prosperous nation on earth, (other than Israel). The dollar will be the strongest it has ever been in the history of the United States, and will once again be the currency by which all others are judged. The Spirit of God says, the enemy will quake and shake and fear this man I have anointed . They will even quake and shake when he announces he is running for president, it will be like the shot heard across the world. The enemy will say what shall we do now? This man knows all our tricks and schemes. 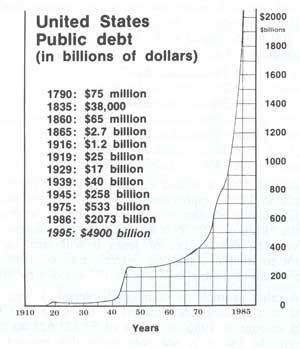 We have been robbing America for decades, what shall we do to stop this? The Spirit says HA! No one shall stop this that l have started! For the enemy has stolen from America for decades and it stops now! For I will use this man to reap the harvest that the United States has sown for and plunder from the enemy what he has stolen and return it 7 fold back to the United States . The enemy will say Israel, Israel, what about Israel? For Israel will be protected by America once again. The Spirit says yes! America will once again stand hand-in-hand with Israel, and the two shall be as one. For the ties between Israel and America will be stronger than ever, and Israel will flourish like never before. The Spirit of God says, I will protect America and Israel, for this next president will be a man of his word , when he speaks the world will listen and know that there is something greater in him than all the others before him . This man’s word is his bond and the world and America will know this and the enemy will fear this, for this man will be fearless . The Spirit says, when the financial harvest begins so shall it parallel in the spiritual for America . The Spirit of God says, in this next election they will spend billions to keep this president in; it will be like flushing their money down the toilet. Let them waist their money, for it comes from and it is being used by evil forces at work, but they will not succeed, for this next election will be a clean sweep  for the man I have chosen. They will say things about this man (the enemy), but it will not affect him, and they shall say it rolls off of him like the duck, for as the feathers of a duck protect it, so shall my feathers protect this next president . 1. to stabilize the USA dollar (because Israelis, Australians and Canadians cannot allow the dollar to plunge)! actual stabilization of the climate, (which fits with Isaiah chapter 35 so even the political right can support this). 3. to help setting the stage for the rebuilding of the Jerusalem Third Temple because frankly.... the fulfillment of Ezekiel chapter 47... can save billions of lives! And it shall come to pass, that every thing that liveth, which moveth, whithersoever the rivers shall come, shall live: and there shall be a very great multitude of fish, because these waters shall come thither: for they shall be healed; and every thing shall live whither the river cometh." so we must appeal to a higher authority for assistance. God's Peace Plan for the Holy Land, Hebrew and Arabic. Hillsong College, in Sydney, New South Wales, Australia, is the training college of Hillsong Church, a Pentecostal Christian church affiliated with the Assemblies of God. The college operates from the church's two main locations, in Baulkham Hills and Waterloo. Brian and Bobbie Houston are the presidents of the college and Lee Burns is the Executive Vice-President. ... because it is her goal to be trained as a worship leader. each human life.... and we human are supposed to agree more and more and more with G-d! Could God the Father be the most emotional being in the universe/ multiverse? Which type of project will you tend to get more involve in? A job that you invested fifty hours of your time in over one month or a labour of love where you exerted a great deal of effort for 50,000 hours over forty years? "As I passed into the second light, the awareness came to me that I had just transcended the truth. Those are the best words I have for it, but I will try to explain. As I passed into the second light, I expanded beyond the first light. I found myself in a profound stillness, beyond all silence. I could see or perceive FOREVER, beyond infinity. I was in the void. I was in pre-creation, before the Big Bang. I had crossed over the beginning of time - the first word - the first vibration. I was in the eye of creation. I felt as if I was touching the face of God. It was not a religious feeling. Simply I was at one with absolute life and consciousness. "There will be a sudden rush to buy farms, ranches, and homes in the country. becoming self-supporting. The price of open rural land will continue to soar. all but syndicates." (David Wilkerson, The Vision, page 18,19). As I listened to Wisdom, it was difficult to comprehend anyone, even this great cloud of witnesses, desiring authority or position in His presence. It seemed that in every moment I had spent here, He had become greater in glory and authority, and I knew that my vision of Him was still limited. Just as the universe was obviously expanding at a great pace and the vastness of it was already incomprehensible, our revelation of Him would likewise be expanding for eternity. “How could mere humans ever represent You?” I questioned. “When My Father moves His little finger, the whole universe trembles. To shake the nations with words does not impress anyone who dwells here. But when even the least of My brethren on earth shows love, it brings joy to My Father’s heart. When even the most humble church sings to My Father with true love in their hearts, He silences all of heaven to listen to them. He knows that one cannot help but to worship when they are beholding His glory here, but when those who are living in such darkness and difficulty sing with true hearts to Him, it touches Him more than all of the myriads of heaven can. Of all that I had yet experienced, the emotion coming from the Lord as He told me this was greater than I had ever experienced. He was not weeping or laughing. His voice was steady, but what He was telling me about worship came from such depths within Him that it was almost more than I could take. I knew that I was hearing the deepest love of the Son of God—to see His Father’s joy. True worship from the embattled, struggling, believers on earth could do this like nothing else could. For the first time, I now badly wanted to leave that place, even with all of its glory, just to get into even the most dreary little worship service on earth. I was overwhelmed by the fact that we could actually touch the Father. One person who worshiped Him from earth during these dark times meant more to the Father than the millions and millions who worshiped Him in heaven. From earth we could touch His heart at this time like we might never be able to do again! I was so overtaken by this that I did not even realize I had fallen prostrate. I then fell into something like a deep sleep. I saw the Father. Millions and millions were attending Him. His glory was so great and the power of His presence so awesome that I felt that the whole earth would not have even measured as a grain of sand before Him. When I had once heard His audible voice, I felt like an atom standing before the sun, but when I saw Him, I knew that the sun was like an atom before Him. The galaxies were like curtains around Him. His robe was composed of millions and millions of living stars. Everything in His presence was living—His throne, His crown, His scepter. I knew that I could dwell before Him forever and never cease to marvel; there was no higher purpose in the universe than to worship Him. Large churches in democratic nations should print their own currencies. while we are still stuck in four dimensional space - time. Page two of this discussion thread elaborates on how huge of a shift I have in mind. The first Intelligence began in.....? Carbon based life less than 5 billion years ago, on earth. Carbon based life in outer space. Fundamental or nearly fundamental energy. This is a new question that I am only now facing.